Webcams have proved to be a popular addition to many beach destinations to see current weather, real-time surf conditions, and beach activity. If you have a great view, a webcam could be a perfect addition for your website. Here's a short clip of boardwalk webcam in Ocean City, one of Maryland's most popular resort towns. 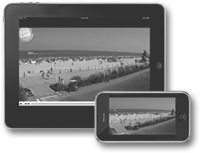 Broadcast anywhere - iPhones, iPads, Android devices, smartphones or tablets. A live webcam is a great way to engage your fan base and and give your social media strategy a kick-start. No plugins to install or software to download, simply click play! Great way to build website traffic, increase search engine rankings, and keep visitors coming back. Our powerful media servers specifically for video streaming can handle large amounts of traffic. Live Webcams encourage users to bookmark their favorite page. Have a webcam project in mind? If you are interested in our streaming services, or not quite sure what you need... send us an email, we’re here to answer any questions you have.